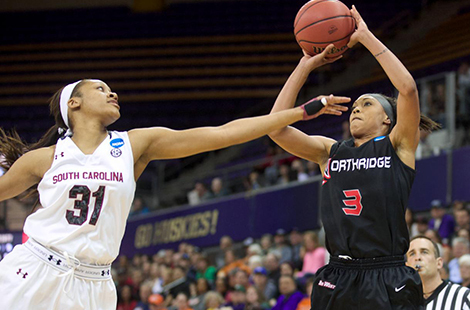 Playing in their first NCAA Tournament in nearly two decades, the CSUN women’s basketball team lost 73-58 to South Carolina Sunday afternoon in the first round of the 2014 NCAA Tournament in Seattle, Wash. However, the Matadors looked like anything but a 16 seed in the match-up with the top-seeded Gamecocks. Read more about the tournament. Jane Small dedicated her life to championing the rights of people with disabilities. Her work will now inspire a new generation of advocates as CSUN awards the first scholarships to in Small’s honor next month. Read more about the scholarship. The students on CSUN’s campus will look a little younger this summer as CSUN offers a series of youth enrichment programs and camps for elementary, middle and high schoolers. Read more about the summer programs. Fri., March 28, 3 p.m.
Conference opener for the Matadors! Fri., March 28, 8 p.m. Sat., March 29, 8 p.m.
More than 5,000 excited graduating seniors and graduate students funneled in and out of the Matador Bookstore Complex this month at the annual spring event, GradFest. Artist and CSUN Chicana/o studies professor Harry Gamboa Jr.’s exhibition, “Vidrio,” focuses on seven photographs in light boxes lining the Hollywood/Highland Metro Red Line Station. Network with members of the North Valley Regional Chamber of Commerce at an event at CSUN.